The Last Leaf Gardener: Tuesday's Truths Week Ten: FB Algorithms AND Being Able To See Content You Appreciate! Tuesday's Truths Week Ten: FB Algorithms AND Being Able To See Content You Appreciate! Welcome to the tenth posting of my blog series known as Tuesday's Truths. Today, I want to let my readers know this: if you want to also see my Facebook content for The Last Leaf Gardener you my have do a few tweaks to your settings. 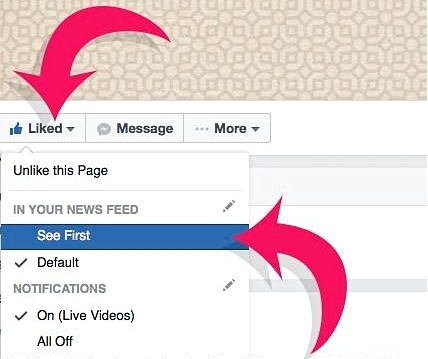 Facebook made some BIG changes to its algorithm for non-personal pages. This may have made it harder for you to access my FB posts. Some of TLLG's FB followers have let me know that they have not seen my posts; and, they thought that they were doing something wrong! I recently learned that if you want to keep TLLG in your FB newsfeed, you must change the setting pictured here (first image as seen on a desktop) under "Liked" to "SEE FIRST" instead of default. And also you need to change the Notification in that menu to "ALL ON." Without making this change, you may not see TLLG in your newsfeed!